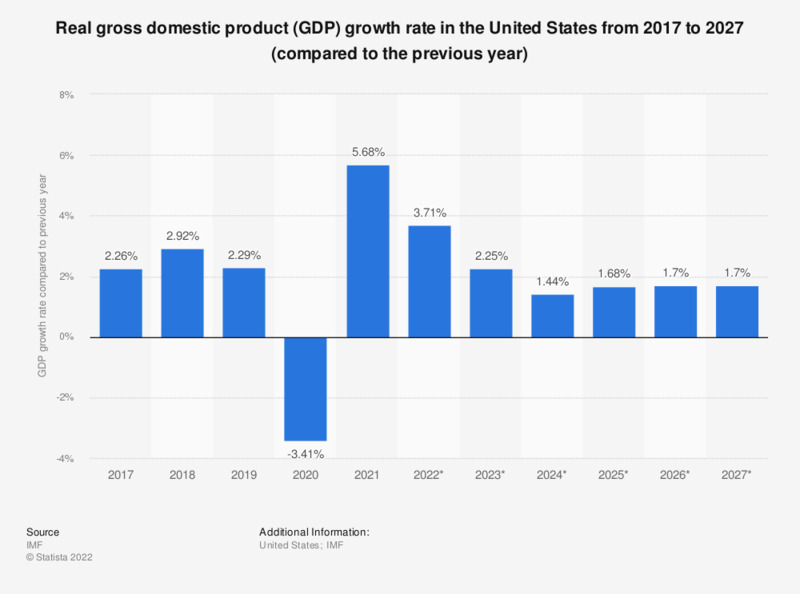 The statistic shows the growth rate of the real gross domestic product (GDP) in the United States from 2012 to 2017, with projections up until 2022. GDP refers to the total market value of all goods and services that are produced within a country per year. It is an important indicator of the economic strength of a country. Real GDP is adjusted for price changes and is therefore regarded as a key indicator for economic growth. In 2017, the growth of the real gross domestic product in the United States was around 2.22 percent compared to the previous year. See U.S. GDP per capita and the US GDP for more information. The gross domestic product (GDP) of a country is a crucial economic indicator, representing the market value of the total goods and services produced and offered by a country within a year, thus serving as one of the indicators of a country’s economic state. The real GDP of a country is defined as its gross domestic product adjusted for inflation. An international comparison of economic growth rates has ranked the United States alongside other major global economic players such as China and Russia in terms of real GDP growth. With further growth expected during the course of the coming years, as consumer confidence continues to improve, experts predict that the worst is over for the United States economy. A glance at US real GDP figures reveals an overall increase in growth, with sporadic slips into decline; the last recorded decline took place in Q1 2011. All in all, the economy of the United States can be considered ‘well set’, with exports and imports showing positive results. Apart from this fact, the United States remains one of the world’s leading exporting countries, having been surpassed only by China and tailed by Germany. It is also ranked first among the top global importers. Despite this, recent surveys revealing Americans’ assessments of the U.S. economy have yielded less optimistic results. Interestingly enough, this consensus has been mutual across the social and environmental spectrum. On the other hand, GDP is often used as an indicator for the standard of living in a country – and most Americans seem quite happy with theirs.